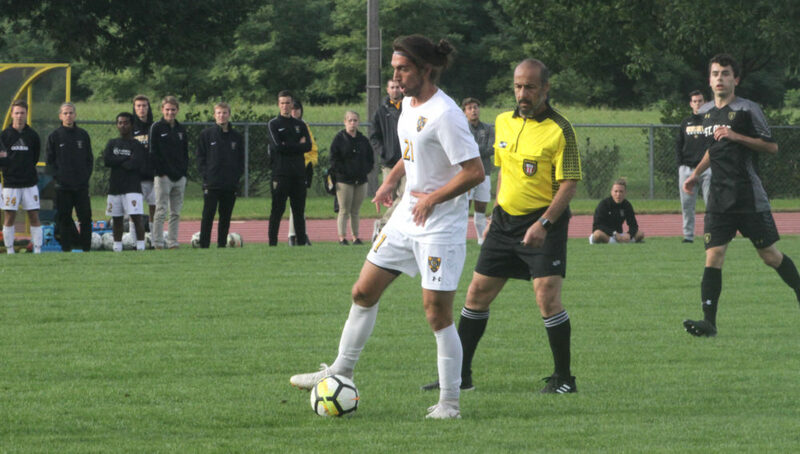 SAINT PETER, Minn. – With less than three minutes remaining in Tuesday’s MIAC men’s soccer match between Gustavus and St. Olaf, Luke Laurich (Jr., Batavia, Ill.) played the role of hero, knocking home the game-winning goal as the Gusties went on to defeat the Oles 1-0. The victory moves the Gusties to 6-1-1 overall and 3-0-1 in the MIAC, which keeps them on top of the conference standings with 10 points. The Gusties had a number of scoring opportunities, outshooting the Oles 10-6 in the first half and 10-6 in the second. The game-winner came after a direct free kick by Léon Equinet (Fy., Bonn, Germany) just outside the penalty arc. Equinet received his own rebound off the blockers, rounded around defenders to his right, and made a crossing pass into the goal area. The keeper deflected the pass, which went to Trace Dobson (So., Sioux Falls, S.D.) who tapped it over to Laurich for the open shot at the 87:19 mark; his second goal of the season. Anders Severson (Sr., Woodbury, Minn.) made five saves in his third shutout of the season. Gustavus next plays host to Augsburg at 3:30 p.m. Saturday.